The stamps are from Pink Ink Stamp Company. If you’re unable to find these exact stamps, any Fall themed stamps would work wonderfully with this layout. Attach 3 Fall color grosgrain ribbons to a kraft card. Stamp sentiment above the bottom ribbon. 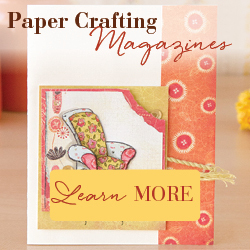 Attach stamped piece to the card with foam tape. You could change the sentiment to Happy Birthday or Happy Thanksgiving for the perfect Fall card!